“Armação de Pêra has the most enchanting Fishermen's Beach which always draws us to wander round with our cameras for an hour or so to enjoy the sights - and smells! - of a working beach. These boats were pulled well up onto the sand away from the shoreline, hopefully avoiding the awful stormy weather we experienced last winter." "Just a big thank you for the picture which now hangs in the Sheldrake Gallery. 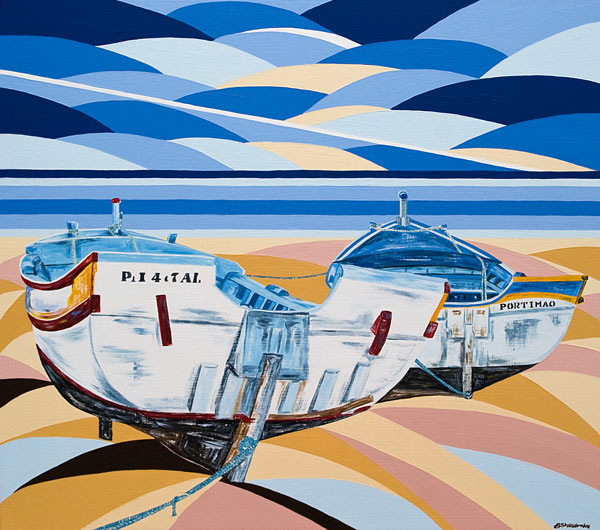 It looks lovely so thank you very much for being so clever at art and stuff, I am useless but if I could paint I would like to be just like you and do fun, bright, cheerful pictures with lots of fishing boats and beaches."